South Korea confirmed its sixth and seventh MERS cases Thursday, surpassing Iran as the country with the fifth-highest number of MERS cases in the world. The two newly confirmed cases are in a health care worker and a patient. Both had been at the same medical facility where the first confirmed patient was being treated prior to his diagnosis from May 15 to 17. The newly diagnosed patient was not even on the authorities’ monitoring list, as the 71-year-old did not share a hospital room with the first patient. Their rooms were at least 10 meters apart, according to Yang Byung-guk, the director of the Korea Centers for Disease Control and Prevention. The CDC defines “close contact” with a MERS patient that may lead to an infection as being within approximately 2 meters or within the room or care area for a prolonged period of time. The man’s diagnosis contradicts the previous explanation made by the Health Ministry, which claimed that MERS was less contagious than many other infectious diseases. Six of the seven confirmed patients are believed to have been infected by the first patient, who was diagnosed with the disease after his trip to the Middle East earlier this month. 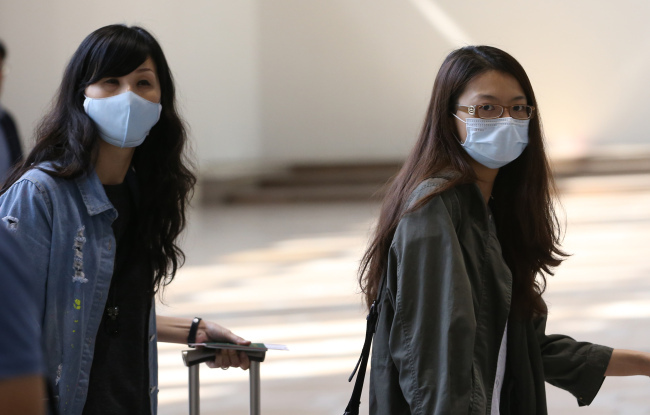 The Health Ministry also announced that a potential MERS patient, who was showing a fever as of May 19, left the country on Tuesday for China via Hong Kong as the authorities failed to prevent him from going overseas. The man, who is currently quarantined in a facility in China upon Seoul’s request, is the son of the third confirmed patient, and the younger brother of the fourth. In its defense, the CDC said neither the third or fourth patient informed the authorities that the man visited them in the hospital room, where they stayed with the first patient, on May 16. The potential patient also did not mention that his family members were infected by MERS when he saw a doctor for his symptoms on May 22. The man eventually told his doctor about his family members’ diagnosis on Monday, and was advised not to leave the country as he may also have been infected. He left for China anyway on Tuesday. His doctor, who should have informed the authorities immediately on Monday, filed a report on Wednesday ― a day after the man had already left Korea. “We should have asked more questions to (the third and fourth patients) and verified things more thoroughly. We regret this has taken place,” said Yang Byung-guk of the CDC. A total of 166 people, including the potential patient, were on board on the domestic flight that traveled from Korea to China on Tuesday. Among them, 28 passengers who sat close to the man were put on a special monitoring list. The Korean government plans to share the list with their Chinese counterpart. Also, three flight attendants are currently quarantined and being monitored in Seoul since their return from China, the Health Ministry said. The Health Ministry has been under fire for its poor handling of the potential MERS patients this week, especially after the diagnosis of the fourth patient whose earlier request to be quarantined had been rejected by the authorities. In response to the public criticism, the Health Ministry announced on Thursday that all passengers arriving in Korea from the Middle East would be monitored for at least 14 days, the incubation period of the MERS virus. The Ministry is also organizing a new study on 74 individuals who may have been in contact with the already confirmed MERS patients earlier this month. Last week, the authorities only included 64 people in their watch list after completing their initial research. MERS is known to be caused by coronaviruses, a large family of viruses that cause a range of illnesses in humans from the common cold to Severe Acute Respiratory Syndrome. There is no known cure or vaccine for MERS, which has a fatality rate of 40.7 percent. More than 95 percent of the confirmed cases worldwide were in the Middle East, particularly Saudi Arabia and the United Arab Emirates. The two countries have the highest number of MERS patients ― 996 and 74, respectively ― followed by Jordan, Qatar and Korea.